In insurance companies, many decisions hinge on finding the right balance between what's best for the customer and what's best for the organization. Data and analytics can shore up the relationship between customer experience and profits, ensuring that decisions remain in balance. An enterprisewide commitment to data and analytics is the key to achieving this balance. 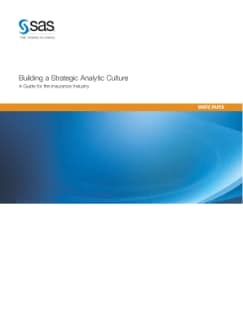 This white paper explains how, by putting the building blocks of a strategic analytic culture in place, insurance companies can move from reactive to proactive decision making – resulting in visibility, executive buy-in and competitive advantage.